I’m a sweater collector. It’s been a necessity, more than a style choice: I live in the Northeast and I hate being cold. (Though, I do appreciate having lots of sweaters to mix and match with separates.) As a sweater lover, I’m always on the lookout for a new style. One of my favorite trends this season for women over 50 has been the sweaters and jackets with leather accents. I recently added the Ann Taylor Collegiate Sweater Jacket (above) (was $129, now $99 with additional 50% off right now.) to my sweater collection. It’s styled like a jacket, but the lightweight tweed knit feels more like a sweater. At this point in my life, my sweater collection includes most of the basics: crewneck and V-neck pullovers, zipped cardigans, scooped and collared sweaters, sweaters made of wool, cashmere, silk blends and so on and so on. (For the moment, I have stowed my three sweater sets in the attic. The aging preppie look isn't working for me.) These days, when sweater shopping, I look for ones with a little offbeat or edgy styling. Garments and accessories with an unexpected accent are both flattering and energizing for women over 50. Leather accents fit the bill. My new sweater has quilted faux leather shoulder patches and trim along the collar. It also has an asymmetric, moto-style zipper, which I love. And it has an “outside zipper,” which has been trending for a while. The sweater is also versatile, which is a big selling point for me. Paired with a crisp white blouse and skirt, it makes a great outfit for the office. I'm a big fan of tweed jackets and jeans. So...I like to pair my tweed knit sweater with jeans for shopping or a casual dinner out. Faux leather (or as Stella McCartney calls it: vegetarian leather) accents often come with a reasonable price tag. 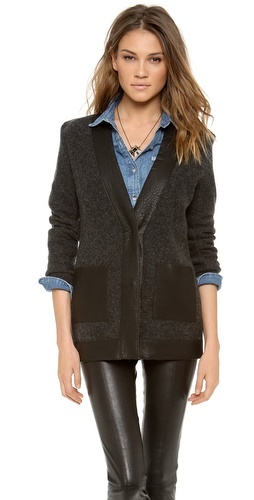 Ann Taylor has a few other jackets and sweaters, including the one below with faux leather sleeves. Right now, Ann Taylor is giving shoppers 50% Off Entire Purchase with Promo Code HOLIDAY. Shop Now! By the by, Flattering50 readers often ask me where I shop for petite sizes. I've been very pleased with the petites I've gotten at Ann Taylor. Shoe Shopping: Anything but Black, please!